Uhm...Peter NEVER went to Rome! 1Peter_5:13 The church that is at Babylon, elected together with you, saluteth you; and so doth Marcus my son. Peter married? That's not in scripture. The only mention of personal aspects of the disciples is of Paul having his own hired house, but that's it. "...yea, let God be true, and every man a liar..."
And yet another reason for us to not trust man! Men lie, and obviously I was wrong. I honestly never have caught that. That's one of those single verses of info that is only mentioned in that one verse, that I remember. But as I have said many times, don't trust me, read for yourselves! Thanks Mark. "...this time your abundance may be a supply for their want..."
It seems like no matter how many times we read the bible, no matter how many years we've reading it, and no matter how regularly we read it - there is still SO much in God's book, that we all tend to forget. I can't tell you how many times I would re-read passages for like the umpteenth time, and I'm like, "I don't remember reading that?" OR "I can't believe I forgot about that!". Even Solomon in Eccl says that much studying is weary on the flesh - but thank the Lord that we have the WHOLE council of God right in front of us, and brethren around us to edify and remind us of other portions of scripture we tend to forget about. And this is why I have a big problem with a lot of these "Christian" books and Churchianity pastors - b/c these authors and "leaders" are being shown the impression that they somehow have super-knowledge on scripture with all they are able to write and speak, that they end up deceiving their followers to forget about rightly dividing the word of truth line upon line, precept upon precept. The funny thing is, that verse is in Catholic Bibles. Mat 8:14 When Jesus came into Peter’s [fn]home, He saw his mother-in-law lying sick in bed with a fever. Mat 8:14 And when Jesus entered Peter’s house, he saw his mother-in-law lying sick with a fever. Mat 8:14 When Jesus came into Peter’s house, he saw Peter’s mother-in-law lying in bed with a fever. So, the deal is, if Peter was married, which scripture says he was, then how could he be Pope? Married men cannot be a priest in the RCC. Oh boy, that's really scientific! The problem with the world system is that people are brainwashed to think they have to believe everything they hear from "authority" figures(whether it's from institutions, the news, etc). Can't tell you the number of times I've exposed this particular RCC lie to professing Christians, and even THIS WOULDN'T convince them that the RCC is evil. They're like, "Why do you hate them so much? ", "Don't judge! ", etc. I mean no matter how abominably wrong the RCC(or whoever is), they're like, "But they're not perfect! ", etc. And yes, saw that about the Vatican "revealing" Peter's (supposed)bones found there. All I will say is that time is really drawing near! A religious reliquary containing blood from the late Pope John Paul II has been stolen from a remote mountain church in Italy, with speculation that a Satanic group could be behind the theft. CANTON, Ohio- A local house and woman who lived there are being investigated by the Catholic Church. The process has begun to one day canonize Rhoda Wise as only the 4th American-born saint. Her house in Canton could become a church-sanctioned shrine. The West Virginia native, who settled in Ohio; got married; and raised an adopted daughter, experienced many hardships throughout her life. During the Great Depression, she was sent home to die, but she claimed Jesus and St. Therese visited her and answered her prayers. The deadly abdominal infection, gaping wound and severely malformed foot were all healed. Many miraculous events have been reported at the house ever since from weeping statues to incredible cures. Rhoda herself had the Stigmata, what many Christians believe is the spontaneous bleeding on the body corresponding with the crucifixion wounds of Jesus. For more than 2 years she bled profusely from her head, hands and feet, but she never complained about the suffering. She accepted it gladly so that others might be healed. Yeah, all of these false Babylonian religions are NO different from the Roman Catholic Cult. As a matter of fact, they teach the SAME things, pretty much. Local media reported that on Wednesday, 500 people visited the house in the normally quiet town of Jalhay to witness what is being referred to as "the mysterious glowing Virgin". The statue, about 30 centimetres (one foot) in height, represents the "Virgin of Banneux", from the name of a nearby village where in 1933 a young girl was said to have witnessed an appearance by the Virgin. The town has since become a pilgrim destination in largely Catholic Belgium, although Catholic authorities from the Banneux sanctuary are expressing caution about the "glowing" Virgin. "It's certain that something is going on but I can't tell you whether there is a natural or a miraculous explanation," said Father Leo Palm, who was sent to investigate the statue by the bishop of Liege. The owners of the statue have refused to allow it to be removed for further examination, saying "she is fine where she is". ‘Delicious Miracle’: Is This Jesus’ Face on a…Pancake? A California cafe recently tried to cook up a pancake that resembled Mickey Mouse, but it ended up looking like something else entirely. Cowgirl Café in Norco, Calif., made the “delicious miracle” on Good Friday — a flapjack that resembled Jesus Christ, according to restaurant owners Gary and Karen Henderickson. Henderickson and his wife said they believe the pancake is a message from above. They placed it in their freezer for now, but are looking for more permanent ways to preserve it. For now, a picture of the pancake will be displayed on the restaurant’s wall for those who wish to see it. “I can’t explain why God acts the way he does,” Henderson said, noting that his brother was recently diagnosed with lung cancer and that he is taking the message seriously. "I can’t explain why God acts the way he does,” Henderson said, noting that his brother was recently diagnosed with lung cancer and that he is taking the message seriously. A crowd of approximately one million spectators crowded St. Peter’s Square in Rome on Sunday for the canonization ceremony for Popes John Paul II and John XXIII, as Pope Francis declared sainthood to the two deceased pontiffs. The event was stated to have been the largest public Roman Catholic gathering since the funeral of John Paul II in 2005. Pope Francis was joined by his predecessor Pope Benedict at the event, as well as leaders and dignitaries from 122 nations worldwide. As part of the rites, Francis was presented with relics from both of the two men–a vial of blood belonging to John Paul II and a fleck of skin removed from the body of John XXIII during his beatification. He kissed each container as they were received and placed at the altar. Tapestries were also hung in the square that bore the images of the popes. “We declare and define Blessed John XXIII and John Paul II to be saints and we enroll them among the saints, decreeing that they are to be venerated as such by the whole Church,” Francis declared in reading his prepared decree. According to Catholic tradition, candidates for sainthood must have been deceased for at least five years and must be believed to be responsible for performing at least two miracles since their death. As John XXIII is attributed by the Vatican as purportedly performing a single miracle, Francis waived the second requirement for the declaration of his sainthood. Adele Labianca claims that after relics from John XXIII were placed on the abdomen of Neapolitan nun Caterina Capitani, the deceased pope appeared to her in a vision and healed the nun of her gastric hemorrhaging. “Pope John told me, ‘The wound is healed,’” she said in a press conference on Thursday before the ceremony. Pope John Paul II is credited with healing a French nun of Parkinson’s Disease, and Floribeth Mora Diaz from Costa Rica claims that his image spoke to her out of a magazine and healed her of a brain aneurysm. However, some are highly speculative about the claims, and are concerned about the unbiblical nature of canonization itself. Mike Gendron of Proclaiming the Gospel Ministries in Plano, Texas told Christian News Network that the declaration of John Paul II and John XXIII as saints is a violation of Scripture. Gendron, a former Roman Catholic who now evangelizes those in the Catholic Church, also took issue with aspects of Sunday’s ceremony, including the presentation of blood and skin to Pope Francis. He stated that such practices are rooted in paganism. As Catholics worldwide will now be expected to call out to John Paul II and John XXIII to intercede on their behalf due to their sainthood, Gendron stated that such a concept is likewise concerning. 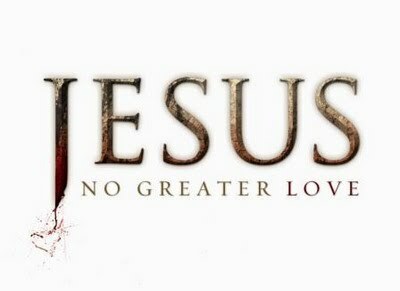 “‘For there is one God, and there is one mediator between God and men, the man Christ Jesus,’” Gendron said, quoting 1 Timothy 2:5. 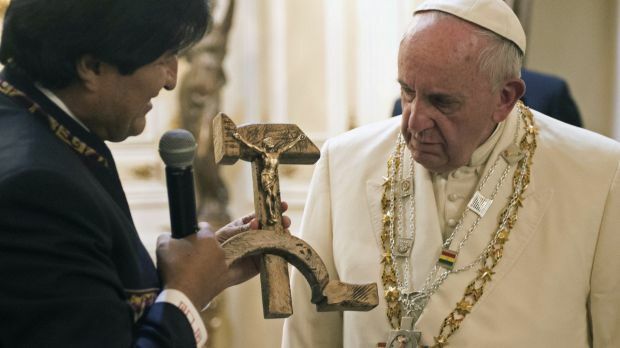 The Vatican is seeking to explain a "Communist crucifix" given to Pope Francis by Bolivian President Evo Morales, saying it's a symbol of dialogue and not an offensive melding of faith and ideology. Mr Morales gave the crucifix carved into a hammer and sickle to Francis when they met on Wednesday upon the Pope's arrival in Bolivia. The Vatican wasn't expecting the unusual gift and it immediately raised eyebrows. It turns out the crucifix was designed by Jesuit activist Luis Espinal​, who was assassinated in 1980 by suspected paramilitaries during the months that preceded a military coup. Francis is a fellow Jesuit and he stopped to pray at the site where Espinal's body was dumped. Vatican spokesman Father Federico Lombardi said on Thursday the Pope had had no idea that Espinal had designed such a crucifix. Father Lombardi said Espinal's fellow priests said he had designed the crucifix as a symbol of dialogue and commitment to freedom for Bolivia during a turbulent time. Many church theologians have bitterly denounced the Marxist influences on Liberation Theology, but Francis has tried to rehabilitate the movement – without the Marxism. Hundreds of Christians are flocking to church to witness a 'miracle' painting of the Virgin Mary who appears to join in with the Lord's prayer. Footage shows the congregation saying the 'Our Father' prayer but after several seconds it's clear several Christians are distracted by something else. f you look closely, the Virgin Mary's mouth appears to move during the biblical reading, becoming clearer towards the end of the video. Baffled George Akary filmed what he believes is a 'miracle' in St Charbel's church, Sydney, before posting it on Facebook. He said: "To clarify for the viewers I saw this during mass and at the end of mass the rosary is prayed. "I went to the altar and wanted to confirm via recording it." Sceptics poured scorn on his viewpoint, claiming that it's a trick of the light coupled with the movement of the camera. But George dismissed this and added: "Lights are not relevant as i have seen this occur under various lighting and have considered those possibilities. "It is what it is... I also did notice whilst the people were praying the lips sped up or slowed down to the prayer been said." Stunned Facebook user Rita Taouk wrote: "Absolutely beautiful," while Rania Boustani simply commented: "Wow." Representative Bob Brady, a devout Catholic and Democrat from Pennsylvania immediately made his way to the podium after Pope Francis finished speaking and grabbed the glass that was still filled with water. He then drank the water, gave some of the water to his wife Debra, and saved the rest for his grandchildren. Representative Brady took photos as well, and had his staff send them out to the press. A Utah Catholic church recently became the site of what some are calling a miracle after a communion wafer placed in water appeared to bleed. The priest reportedly then placed the wafer into the water, expecting it to dissolve in just a few minutes. But that's not what happened. Instead, the wafer remained intact for several days. What's more, it turned a deep blood red. News of the apparent miracle sent shockwaves through the church community and devotees began to pack into St. Francis Xavier's to see the host on display. Word also spread to the Salt Lake City Diocese, where a five-person committee was formed to investigate the potential miracle, reports KSTU. "Recently, reports of a bleeding host at St. Francis Xavier Church in Kearns have been circulating within the diocese. Monsignor Colin F. Bircumshaw, Diocesan Administrator, has appointed an ad hoc committee of individuals with various backgrounds to investigate the matter. "The work of the committee is now underway. The results will be made public. "The host is now in the custody of the Diocesan Administrator. Contrary to rumor, there are NO current plans for public exposition or adoration." What some are chalking up as simply a “faulty coating” has others believing that a divine phenomenon has touched the window of one local church — along with the hearts of its parishioners. That’s because an image that bears a striking resemblance to the Virgin Mary seems to have appeared on a portion of glass at the Transfiguration Catholic Church in Marietta, bringing throngs of onlookers eager to see what some believe to be a Christmas miracle. Father Fernando Molina-Restrepo posted a photograph of the window on Facebook this week and explained that image appeared on December 12, which is also the Feast of Our Lady of Guadalupe. He wrote that many are offering their own interpretations of how the foggy figure formed, perhaps the pane’s coating reacting to a mixture of the outside elements, though there are plenty of spectators who are happy to point to their faith as the true cause. Parishioner Victor Jose Alvarado, who was at the church when the image first appeared on the window inside Bishop Hall, told CBS Atlanta it was one of the most “wonderful experiences” he’s ever had, and shared a photo he took with us. Two people are dead and hundreds were injured on Saturday as massive throngs sought to press up against a centuries-old statue of Christ that was marched through the streets of Manila as part of an annual Roman Catholic celebration called the Feast of the Black Nazarene. Manila Vice Mayor Isko Moreno estimates that 1.4 million people participated in the procession, which takes place every Jan. 9th in the city. Roman Catholics carry white cloths and seek to touch the wood carving of Jesus carrying the cross out of their belief that it possesses healing powers or can bring good fortune. This year was no exception, as some followers along the 20-hour procession handed cloths to those who were adjacent to the carriage, hoping that they could swipe the idol for them. For the past 200 years, millions have flooded the streets as the wooden carving is carried through Manila for its annual feast day. Those who observe the occasion, which includes men, women and children alike, usually walk the streets barefoot as a gesture of reverence toward the statue. The event can sometimes become dangerous as the throngs push one another out of the way. Reports state that one man, Alex Fulyedo, 27, died after suffering a seizure during the event, and a candle vendor, Mauro Arabit, 58, had a heart attack and was declared dead on arrival at a local hospital. The Philippine Red Cross says that it treated over 1,200 people for injuries, which included cuts, abrasions and bruises, as well as those who sought to have their blood pressure checked. A few also complained of shortness of breath or struggled with ailments that required hospitalization. The procession began at 6 a.m. on Saturday and concluded at 2 a.m. on Sunday morning, and was guarded by an estimated 5,000 police officers and members of the military. His name was Padre Pio, he was a Catholic monk who died in 1968, and he is prayed to by millions of Catholics around the world. Pio is said by the Catholic Church to have had the “stigmata” – the bleeding wounds of Jesus on his hands and feet. In 2008, in true necromantic fashion, his dead body was dug up and made into a shrine inside a glass coffin. His body was partially reconstructed with a life-like silicone mask and preserved in a large, temperature-controlled glass reliquary so the faithful could view it. Now Pope Francis has ordered the corpse of Padre Pio to be displayed in St. Peter’s Basilica during the Catholic Church’s current Holy Year on the theme of mercy. The body, along with that of another, less famous saint that is being transported to Rome from northern Italy, will be displayed in a Rome church before both are moved in procession to St. Peter’s on Friday. This is all part of the unholy, demonic obsession by the Catholic Church to worship these artificial “saints”, pray to the dead, and to get people’s eyes off of Jesus Christ and on anything else. Look at the woman with her hands and face pressed against the glass coffin of Padre Pio in the photo at top. She is crying like she lost a family member, and she is PRAYING TO HIM for guidance and help with her life. All of this fostered, sanctioned and encouraged by Pope Francis and all levels of Vatican authority. This activity is absolutely forbidden in the Bible, and had much in common with cultic Mormon rituals and ceremonies for the dead. You are looking at what the Vatican **** of Babylon loves to do best, deceive people. Starting today, the corpse of Catholic shaman Padre Pio will lie in a glass coffin, and over 1 million people will file past to lean over the coffin to pray to him, venerate him, which is simply another way to say worship him. Thousands of Orthodox Christians are flocking to a church in southwest Chicago to witness what they believe is a miracle. According to the Chicago Tribune, tiny drops of sweet-smelling oil have been trickling down an icon of John the Baptist at Assumption Greek Orthodox Church in Homer Glen. The parishioners believe the droplets have healing properties. Parish priest Rev Sotirios Dimitriou – known as Father Sam – said: "The first thing out of my mouth was 'What do I do?' You don't expect anything like this. It's breathtaking. It's so powerful to see such an act of God before your eyes." The auxiliary bishop of the diocese told the Tribune it would not comment on whether the phenomenon was genuinely miraculous, saying "We let the faithful believe it if they wish." Bishop Demetrios added: "If it brings you closer to God that's wonderful. If it doesn't, it doesn't." The oil exudes from the icon's halo, wings, hands and beard and is collected in a reservoir of cotton at its base. Dimitriou saturates cotton balls with the substance and hands them out to his parishioners. He has had several reports of divine healing from those who have touched it. One man said a blocked artery had cleared, while another claimed to be cancer free. Dimitriou himself, who had experienced blackouts because of a nerve condition, said he had not suffered since the oil began to flow and had stopped taking his medication. The Tribune quotes James Skedros, dean of Holy Cross Greek Orthodox School of Theology, who said that similar episodes have taken place across the US. While unlike the Roman Catholic Church the Orthodox Church has no formal process for authenticating them, they are regarded as significant for believers. He said Orthodox Christians believe matter can be a conveyor of sanctity. "We have a very different understanding of matter as a vehicle of holiness," Skedros said. "We put [icons] on walls, burn candles in front of them, light incense in front of them because they're images of what they represent — the holy person or image of Christ or the saint." Meanwhile the church itself is struggling with the number of visitors it is receiving because of the phenomenon. A statement from the diocese said: "We are blessed to have this occurring at our parish in Homer Glen, Illinois. "We ask for patience and understanding when wanting to visit this icon or request additional information as this is a small community parish that is trying to work out how best to share this blessing with now a much enlarged audience." A statue of the Virgin Mary Semiramis in Fresno appears to be weeping. The family who owns the statue calls it a miracle and said it's been happening for a while.